Explore sacred sites, ancient wonders, and religious places around the world with maps, photo galleries and even a blog. Covers every major countries including of course the Camino de Santiago in Spain. And appreciate the sacred sites in your own country. One of my favorite movies of all time, Forrest Gump's run is his camino. The clip from the movie shown here mashed with music from 'A flock of seagulls'. At least he has found what he is looking and stopped running in the end. I am still running. Per Month: January 350; February 666; March 1,680; April 8,109; May (up to the 22nd) 9,337. Age: 1-16 years 1,541; 17-35 years 5,845; 36-65 years 11,230; 66-100 years 1,529. 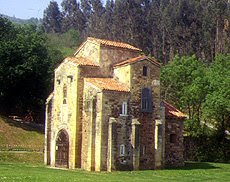 Path: Camino Frances 15,880; Camino Inglés 210; Camino del Norte 627; Camino Portugués 1,928; Camino Primitivo 398; Via de la Plata 1,033; Other 69. Method: on foot 17,028; by bike 2,986; on horseback 127; on wheelchair 4. Motive: Purely religious 7,507; religious/cultural 12,046; non-religious 592. From: Argentina 84; Australia 152; Belgium 170; Brazil 253; Canada 333; Denmark 177; Finland 116; France 1,530; Germany, 3,256; Holland 290; Ireland 276; Italy 927 Japan 45; Korea 70; Mexico 100; Norway 154; Portugal 1,149; South Africa 42; Spain 8,911; Sweden 45; Switzerland 186; U.K. 407; United States 453. Starting at: St-Jean-Pied-de-Port 2,064; O Cebreiro 1,441; Leon 1,329; Roncesvalles 1,317; Ponferrada 816; Pamplona 788; Le Puy 686; Astorga 681; Burgos 564; Porto 539; Villafranca del Bierzo 343; France (?) 291; Ourense 250; Oviedo 200; Ferrol 150; Germany 142; Irún 113; Logroño 111; Lugo 97; Fonsagrada 95; Jaca 65; Mérida 65; Lisboa 59; Bilbao 58; Braga 55; Holland 50. What dreams do you have while you are walking the camino? I don't mean those that you have while walking but those when one is asleep at night. I have a recurring one. Twice in the Camino Frances last year and once this year during my Camino Primitivo. In my dreams I woke up twice at home and once in the US in my college years (that was ages ago) realizing that I have not yet finished my walk in the camino. In a frantic state to return to Spain and resume my camino, that's when I woke up from my dreams. One could have easily intepret the dreams as fear of not able to complete my camino perhaps due to injury (real or perceived). Whatever it is, I hated these dreams (nightmare). 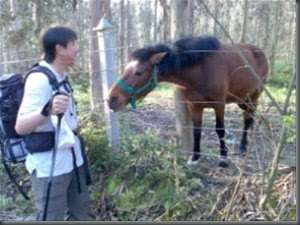 During my camino last year, I've met a friendly horse after Melide. I even wrote about it on this. This year on my camino primitivo, I have found him again. I saw him and actually call out to him. Immediately he came straight towards me to be patted. He's just as friendly as ever. I think he recognized me. Last year I was in pain from tendonlitis and he was there to console me. This year I think he is just happy to see me. I hope we can do the same again next year? 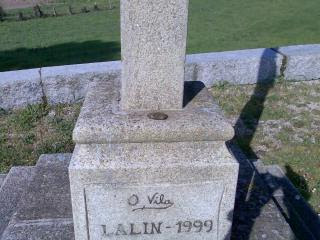 Looking at this marker, you will normally think that the direction of the camino is to your left right? Unfortunately it is not always true on the camino primitivo. This camino covers two region in Spain, Asturias and Galicia. On the Asturias side, the direction is to the right. When I crossed over to Galicia, it is back to the norm which is to the left. 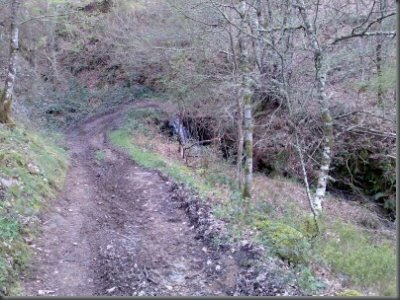 This difference had gotten me lost during the first day of my camino primitivo. I had so much fun creating the video for my Camino Primitivo that I have decided to do another one. This one is for the Camino Francés which I had done the previous year. If you have been following this blog, you would have seen all the photos in this video and more. It's just that the video is a perfect way to pack it all in. Again I have chosen another soundtrack from Red Hot Chilli Peppers. It's one of my favorites tracks that I was listening to while walking that camino. Hope you enjoy the video clip. A stone of hope to carry for my way. No Cruz de Ferro on this primitive route. 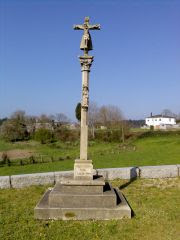 I am leaving it on this stone cross after the mountains, in a little town after O Cadavo. I hope his operation is successful. *Update: The heart operation is a success. I am relief. My camino primitivo effectively ends today as I am back on the French way. 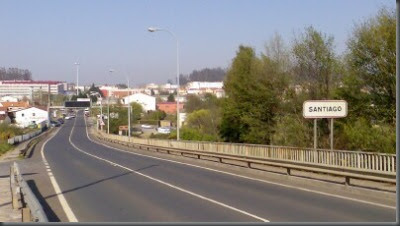 Lugo to Melide. Darn, so crowded and noisy at the albergue. Because there is no albergue after Lugo, the original plan was to walk from Lugo to Palas de Rei (35.2 km). I don't know how I did it but I have followed the shells and ended up much further up in Melide. I have to check the distance but it has got to be more than 40 km. I had walked almost non-stop from 7.40 am to 6.40 pm (11 hours!). I am totally exhausted. Just finished my meal and will be sleeping very soon. No pictures this time, but I promise more when I get to Santiago in 2 days time. My first update after 7 days. I am now in Grandas de Salime. One of the few towns big enough to have internet access. Tomorrow I will be leaving Asturias and entering Galicia. It will be a tough day. See for yourself. The mountain on the other side is Alto del Acebo (not the same as the french way). This was a shot from this morning. I am now somewhere at the bottom. 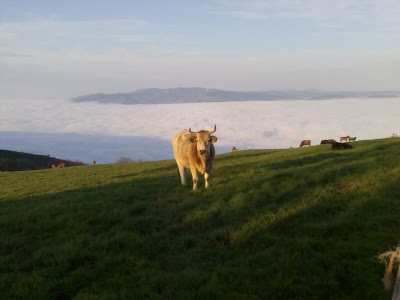 Over the top of the mountain is Galicia. Camino Primitivo is also in many ways more primitive than the Camino Franca. 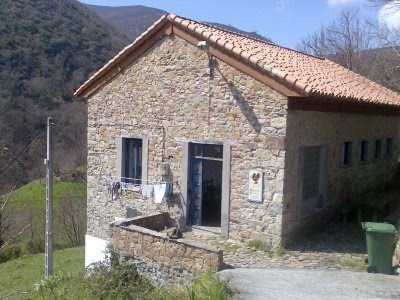 Many albergue are situated in a place with only farm houses and no food so you will have to buy provisions in advance. Many villages are so small there is not even a bar to have coffee or restaurants for a meal. You will be considered lucky to have coffee before the afternoon. I ended up drinking too many cups near the end of the journey each day. Let's hope the situation is better after Galicia. Albergue in Peñaseita. Beautiful view. No restaurant but at least there is bar nearby. All the laundry you see is mine. Shared it with 2 other pilgrims that night. This camino goes through a mountainous area. You go up and down quite often. It can be cold and misty, but when it is clear it is like being in heaven. Not recommended for the first timers, but for anyone who has done the French way, this will be a very good one to go next. It is very different experience, but the essence of the camino is still there. I'll write again when I am able. For more pictures, it will just have to wait until I am back. Arrived just before 7 am at the train station in Oviedo today. It was raining. What a way to start the camino. Waited until about 10 am to find out that I could not get my credential (pilgrim passport until 6.30 pm). That's it, I won't be able to start my camino until tomorrow (5th April). Meanwhile, there's nothing I could really do except checked in a pension and look around the city. One good thing that comes out of this is that I don't need to make a detour tomorrow to see the beautiful pre-romanesque churches around Oviedo. San Julian is in the city, Santa Maria del Naranco and San Miguel de Lillo about 45 mins walk on the hillside in the outskirts of Oviedo. The churches is stunning. So small and beautiful. These photos are courtesy of Stanford U. and Oviuni since I had forgotten to bring my USB adaptor for my camerphone to the internet cafe. Oviedo is a very nice city. It's big but very comfortable. I particularly liked the fact that it has lots of pensions and hostals next to big hotels. Also went shopping for a pair of walking sticks. With the credential that I have just got, I can now recharge from all the travelling and transits, and head off into the hills tomorrow to start my camino. I will switch mode from a tourist to a pilgrim then. I am currently in Chamartin station in Madrid with 5 hours to kill before my overnight train to Oviedo. Currently writing this at the internet booth at the station since I have nothing better to do. I hope to start my camino bright and early tomorrow. Hopefully no delay in getting my credentials (pilgrim passport) at the church in Oviedo. Checking on the weather in Oviedo, it does not look good for tomorrow. It's going to be wet. The following 2 days however are looking better. I will be embarking on my second camino next week. This is very sudden, even for me as I have suddenly found myself free from now till the end of April before my next contract job starts. 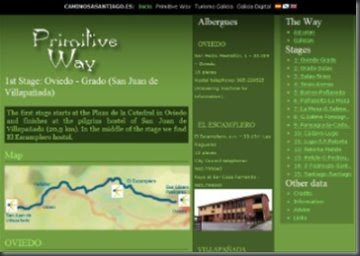 Camino Primitivo was the first camino route, even before the Camino Franca. Alfonso II was the first who took this route when the Saint James body was supposedly discovered in Santiago de Compostela. At that time around the 9th century, only the extreme north of Spain were free of the Moors. This journey starts in Oviedo, and with a distance of 343 km will take around 14 days. I should be in Madrid on the 3rd April and hope to begin my journey in Oviedo on the 4th or 5th April and return home on the 20th April. Not have enough time to get a guide for this trip from CSJ. This online guide which I had just printed will have to do. From sharfrantan. A simple but every effective video. Only words (and cool music). Just makes me want to drop everything and start another journey immediately. 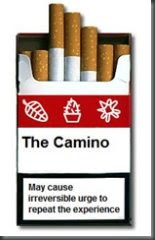 Like all addictive substance or activity, the camino should carry a warning label. I still thought about it almost every day, and will be walking it again very soon. Hmmm. A seven percent increase over 2005. Looks like the Camino has already peaked. I'm touched by the 848 who did it in winter, although the past winter might have been particularly warm. 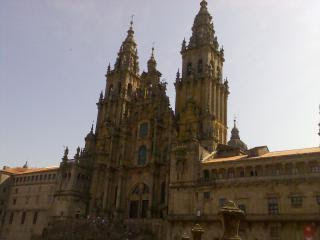 ·100,377 pilgrims received the compostela in Santiago in 2006. This number is an increase of 6,453 over 2005. ·There were a record number of pilgrims from 138 countries during 2006 – compared with only 91 countries in the Holy Year of 2004. They came from places like Aruba and Turkmenistán, Greenland and Kenya. ·The number of pilgrims from Africa has grown to 206. ·The numbers have also increased from South America, Asia and the Australian Continent. 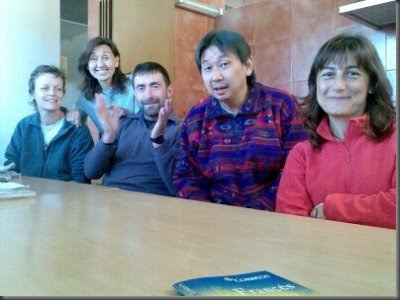 ·It was not unusual to see pilgrims in the Praza do Obradoiro from Malaysia, Sri Lanka, Taiwan, Tanzania, Turkmenistán, Urbekistán or Zimbawe. ·Thousands of pilgrims came from the from European countries including the Principality of Monaco. ·As for Spain, the greater number of pilgrims came from Catalonia, Madrid or Castilla Leon. ·Pilgrims also came from the Canary Islands, Ceuta and Melilla. From Ceuta, for example, 54 people earned their Compostela. ·The French Way continues to be the “King” of all the Xacobeas Routes. ·82,407 pilgrims chose this Way - three thousand people more than in 2005. 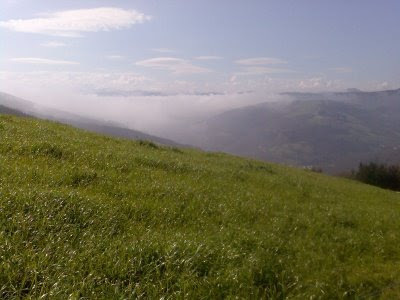 ·Walking is still the favoured way of making the pilgrimage. 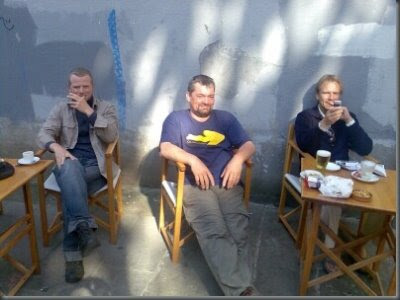 ·11 people did the pilgrimage in wheelchairs. ·237 pilgrims were over 75 years old. ·The months of July and August were the most popular. In July there were 18,560 pilgrims and in August 25.968. ·The experts say that those who travel at winter travel the most authentic way; those who have to go through snow, mountains and other difficulties. 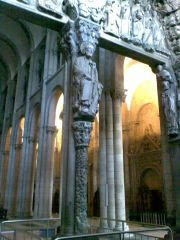 ·The past December 848 authentic pilgrims arrived at Compostela. “Heroic "
·Hundred of pilgrims spent the last hours of year 2006 to arrive at Compostela just in time to take the grapes from Nochevieja. The majority “were foreign”, explained the Santiago Office. They chose, generally, the French Way from its beginning. That is to say, from the Pyrenees locality of Saint Jean de Pied de Port. 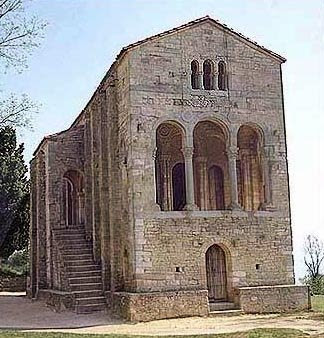 ·The first pilgrim of 2007 to arrive was a 29 year old from Madrid.